Drywall is a common building material used on walls and ceilings. It is also referred to as plasterboard or gypsum board or by its common trade names Sheetrock and Gyproc. It is composed of two heavy paper sides with a slab of compressed gypsum between them. It is known as "dry wall" because it replaced lath and plaster, which was applied "wet". Drywall is produced from calcium sulfate, which can be mined as the mineral gypsum in sedimentary rock layers in some areas. The paper base is often made from recycled cardboard and newspaper. Calcium sulfate is increasingly produced as a byproduct from chemical scrubbers in the smokestacks of coal burning plants. Sulfuric acid and other sulfur compounds that could be a serious pollutant in the smoke, are removed by combination with lime (calcium carbonate from limestone) to produce gypsum. The calcium sulfate is hydrated, (i.e. combined with water) which gives drywall its fire and heat resistance. Drywall is used to clad walls and ceilings and then painted or covered with wallpaper. It is typically screwed or nailed to wood or metal wall studs, often set on 16-inch or 400 millimeter centers. Drywall is not weight bearing and is not suitable for floors. However it can add shear or racking strength to a framed structure. 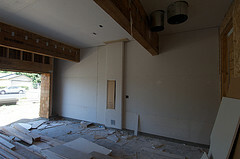 Drywall can be installed with the sheets lying either vertically or horizontally, horizontal being more common in North American residential construction. For added fire protection or soundproofing, sometimes two layers are installed with the long edge perpendicular to the other. Special fire-rated 5/8 inch thick drywall is also used. After it is screwed or nailed on, outside corners are often protected by applying a "V" shaped galvanized metal or plastic strip ("corner bead") to the corner. When finished, the corner bead prevents casual damage to the exposed corner. Drywall is usually finished by filling in the joints and nail or screw holes with joint compound, referred to as drywall "mud" by tradespeople. The joints are reinforced with paper or mesh tape imbedded in joint compound. Drywall used in office partitions is often faced with vinyl wallpaper and the joints are hidden with decorative battens or strips. In North America, drywall is typically available as 4-foot (1220 mm) wide sheets of various lengths from eight feet (2440 mm) to sixteen feet. It comes in various thicknesses, most common being 1/2 inch (12.5 millimetres), but is also available as 1/4 inch, 3/8 inch, 5/8 inch and up to 1 inch. In other countries, the typical width is 1200 mm, with lengths starting at 2400 mm and available in 300 mm increments up to 3600 mm. In metric countries, boards are typically 12 mm, 12.5 mm or 12.7 mm thick, and can range from 8 mm to 25 mm thick. Drywall has very little water resistance. When a leaky roof or condensation wets drywall, the gypsum can dissolve away and leave just a layer of painted paper in its place. A more water resistant form has a water repellent coating on one of the paper sides. The coating is usually green and it is called green board. Green board is a cheap solution to backing tile in a bathroom. In a heavily watered area, such as a shower, it is recommended to use cement board or other water resistant substrates instead. Drywall can also have a layer of aluminium foil on one side. This layer acts as a vapor barrier preventing the flow of moisture-laden air into the wall cavity, avoiding condensation and eventual mold and rot. However, the foil layer severely limits the transmission of radio waves, such as Wi-Fi signals. This page was last modified 11:18, 12 September 2013.